English version page "Martines Image"
Martines Image Group has been running successfully on the Russian cosmetic market for many years, and is the largest exclusive distributor of 14 global professional brands. The company’s mission is to fully meet the needs of beauty industry professionals by offering the best and latest developments in global cosmetology and aesthetic medicine. Martines Image was founded in 1995 as a wholesale distributor of professional products to the Russian beauty market. The company was actively involved in major international and regional tradeshows, congresses, conferences and massmedia advertising, and was able to acquire an extensive list of clients and partners. 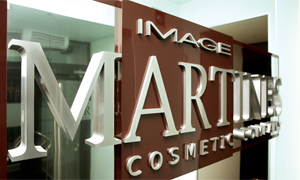 Today, more than 6,000 beauty salons, medical centers, plastic surgery clinics, spas, fitness clubs and private cosmetologists are among Martines Image’s clients. Being aware of the importance of continuously raising the qualifications of specialists in today’s beauty industry, Martines Image established a training center. The training center team comprises highly qualified medical professionals, cosmetologists, biochemists, nutritionists, and homoeopathists that hold themed seminars, workshops, lectures, and presentations on numerous innovations, methods and products in cosmetology and aesthetic medicine. Martines Image’ core team has worked together for 23 years. Martines’ employees are the main assets of the company, and for this reason, we try to create all the necessary conditions to foster real professionals. Martines Image believes that the company development and education of employees is the integral part of company success. We employ a team of excellent professionals with an extensive track record stemming from their experience in the Russian beauty market. In 2008 Martines Image expanded into the retail sector by opening a chain of their own beauty boutiques, «Season Krasoty», which features personal beauty care products by leading European, Canadian and Japanese brands. Amenity face and body products are considered the highest quality ones in Japanese skincare and regenerating skin through glycol peeling combined with revitalizing cellular care on the basis of placenta extract, hyaluronic acid, and extracts of rare oriental plants. Scientific, innovative, highly performing skincare based on plant cell extract and biotechnological systems with highly concentrated active ingredients for maximum efficacy. Ericson Laboratoire products offer professional beauty care indicated for intensive face, body and décolletage skin treatment. La Mente is a facial skincare rejuvenation line based on cell extracts, stabilized vitamin complexes, proteins and other bioactive components featured on unprecedented quality, high effectiveness, and admirable product textures to create personalized skin care programs to meet specific aesthetic needs. Unique system of professional skin care, developed and manufactured by Canadian research center together with specialists of key plastic surgery clinics in Beverly Hills. It allows to correct a wide range of aesthetic defects. Meillumé is the embodiment of scientific approach to professional skin care and the next level of cosmeceutical evolution. Phymongshe is a professional aesthetic brand including two original peeling programs for face and 5-steps program body skin care. The main idea is a fusion of precious botanicals and cutting edge technology in each product. Phymongshe is striving for realization of the most advanced beauty solutions, with mission of making women’s dream come true. Brand: Carboxy CO2 gel mask (South Korea) - metabolic rejuvenation activity and highlight of aesthetic procedures. Brand: Collagen masks (Germany) - structure redensifying action. Brand: Beta-glucan masks (South Korea) – anti-age and post-treatment effects. Mesotech offers the broad product line of aesthetic mesotherapy cocktails that have been developed and produced in Europe through the extensive scientific research and dedication of a team of dermatologists. Q-Lab mesotherapy products (monopreparations, vitamin complexes, mesotherapy cocktails) are designed to effectively and considerably treat the widest range of beauty concerns such as aging skin, cellulite, localized fatty deposits, stretch marks, hyperpigmentation and alopecia. OmeoTossicologici Italia (O.T.I. ), an Italian pharmaceutical group of companies, features a broad spectrum of antihomotoxic, homeopathic and phytotherapy product lines for biomesotherapy, biorevitalization based on biotechnological hyaluronic acid, chemical peels and natural plant-extract based skin products to establish holisthic aesthetic treatments. Beauty Image provides a broad spectrum of treatments and tools for bioepilation, paraffin therapy and parafango, accessories and other equipment. Wide choice of consistency professional sugar pastes, cosmetics and accessories. Framesi is a producer of professional hair care products offering a full assortment developed on the basis of the latest innovations for use in hair salons, including four groups of colouring agents, a spectrum of treatments for hair restoration and scalp therapy, styling products, accessories and professional styling tools. Face care machine for ultrasonic peeling, phonophoresis, LEDcolour therapy. Multifunctional beauty machine for light and ultrasonic facial treatment. Martines Image Group has its headquarters in Moscow, with branch offices in St. Petersburg, Pyatigorsk, Rostov-on-Don and Krasnodar,Kazan, Novorossiisk, Simferopol, Sochi, Stavropol, Vladikavkaz; as well as regional representatives in all major Russian cities, Belarus, Ukraine, Kazakhstan and other CIS countries.